Want to hear something weird? 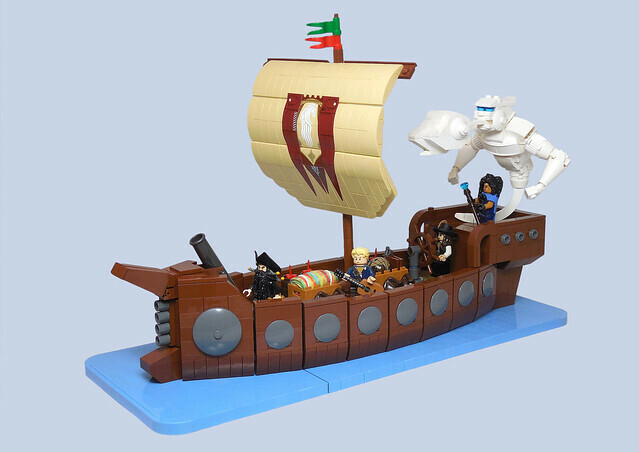 I have something strangely in common with this MOC by vitreolum... I was the clouds in the movie Cabin Boy. Way back in the early 90's my friend Tony Gardner was doing the makeup for the film, and they needed someone with an expressive face, so naturally they thought of me (the human cartoon). I'll refer you to this old episode of Movie Magic for more info. A self imposed challenge on this MOC was a curved, studless sail. I'd say challenge accepted, and conquered.